One of my favorite pastries is a freshly baked danish stuffed with all sorts of deliciousness. 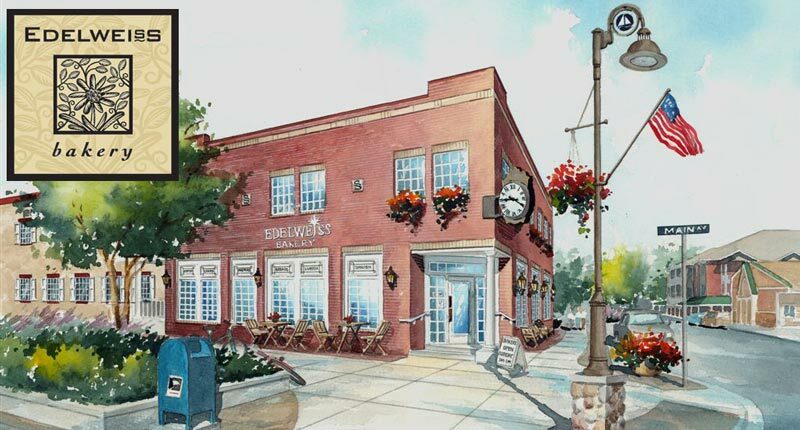 In my part of town sits an adorable German bakery called “Edelweiss” that luckily for me and my sugar loving teens, is only a short tempting 10 minutes from my house. The bakery shelves are jammed packed with dozens of fresh, delicious pastries that the baker had just baked only hours before. It’s a little slice of heaven on earth. In my opinion, pastries – and especially danishes – are one of life’s most amazing food creations. But who and where did this gift from above come to be? Well, it all began in 1850 when a strike by bakery workers in Denmark began. Bakery owners were forced to hire workers from abroad, including Austria. Like many immigrants who bring their traditions of food along with them, the Austrian bakers brought their tradition of pastry making. But it was their cake called “Plundergebäck”, known to us as a “Danish” that quickly changed the baking industry in Europe. So how did the tradition of Danish baked goods come to the United States? Around 1915, Herman Gertner, owner of a chain of New York restaurants brought Lauritz C. Klittleng, a Danish baker, to the United States to sell Danish pastry. It quickly became such a highly sought after delicacy, that President Woodrow Wilson had the Danish baker make Danish pastries for his wedding that very December. Needless to say, it was a hit. The problem with famous hometown bakeries is that they are popular. I’ve learned the painful pastry lover’s lesson that if you don’t get to the bakery early in the morning, a lot of the super fantastic choices, that had your name written all over it, have walked off with some lucky chap other than you. As they say, the early bird gets the worm or in this case – the Danish. However, I have found a way to beat the system by making my own freshly baked danishes right at home. 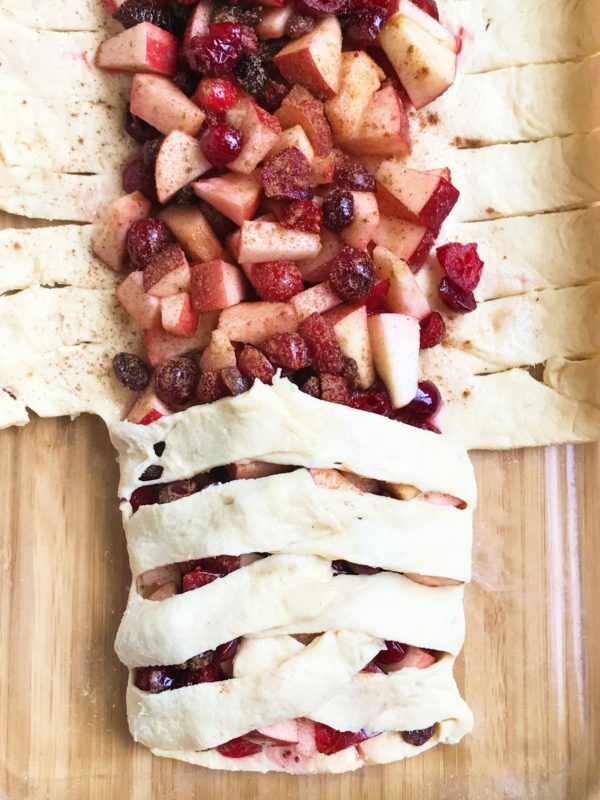 I just love this Cranberry Apple Crescent Braid recipe because it has all of the good stuff, and you can alter this recipe to include everything you love in a pastry. Dream with me now; cream cheese filling, baked apples, cherries, peaches, chocolate sauce, lemon flavor. Oh, I could go on and on, but instead, I think I will grab the flour and apples and get baking! 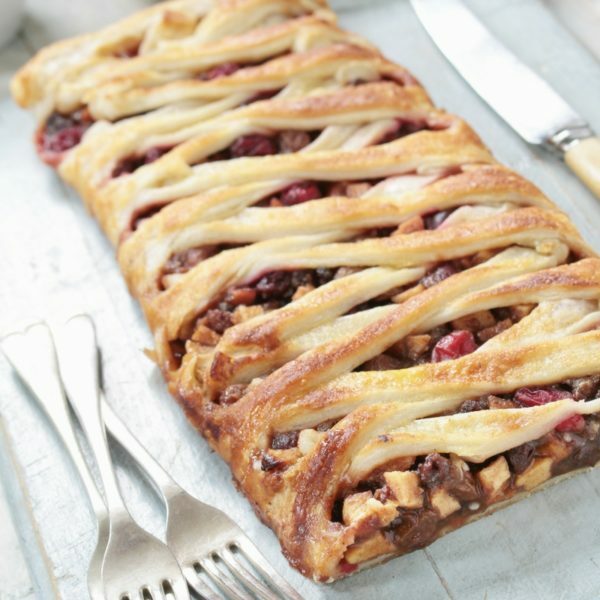 Cranberry Apple Crescent Braid looks complicated but is really quick and simple to make. 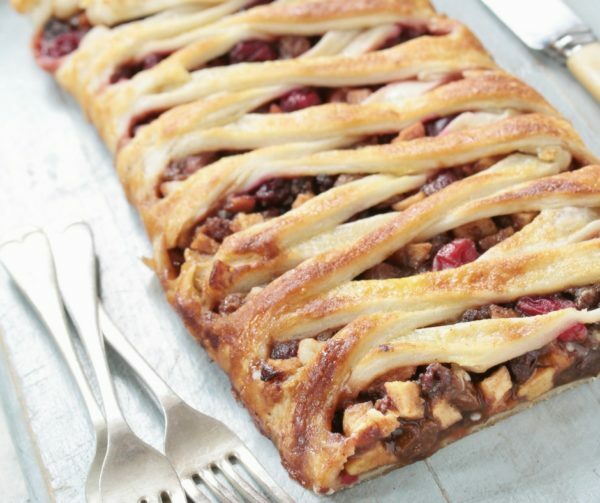 Made with apples, cranberries and raisins or choose your favorite combination of fruits and flavors to create your own. 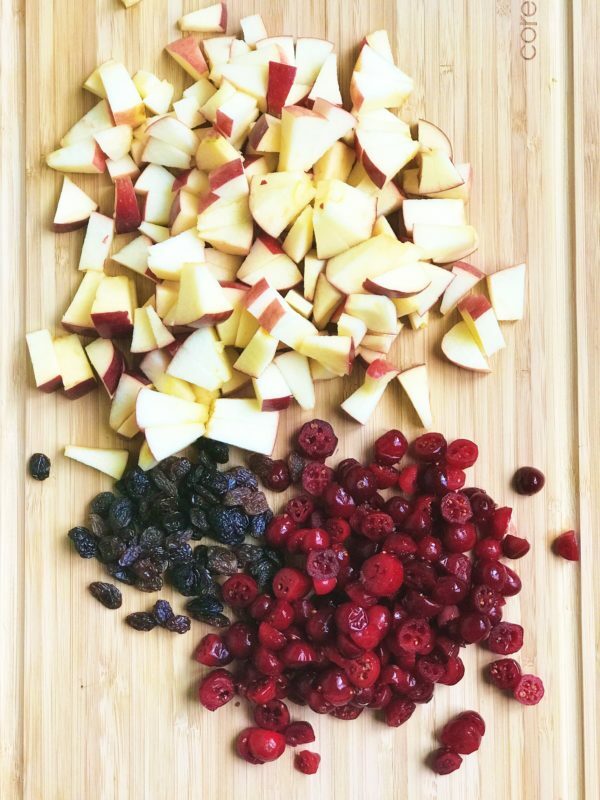 In medium bowl, combine chopped apples, raisins and cranberries. In a small bowl, mix sugar, cinnamon, and nutmeg. 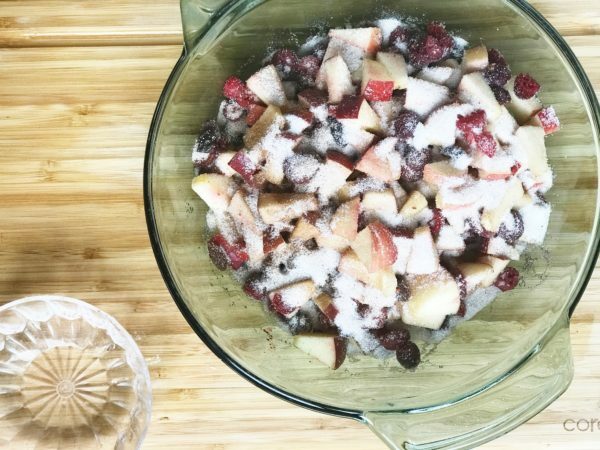 Pour over the fruit mixture and toss lightly. Set aside. Unroll crescent dough and set inside a lightly greased 9 x 13 baking pan. 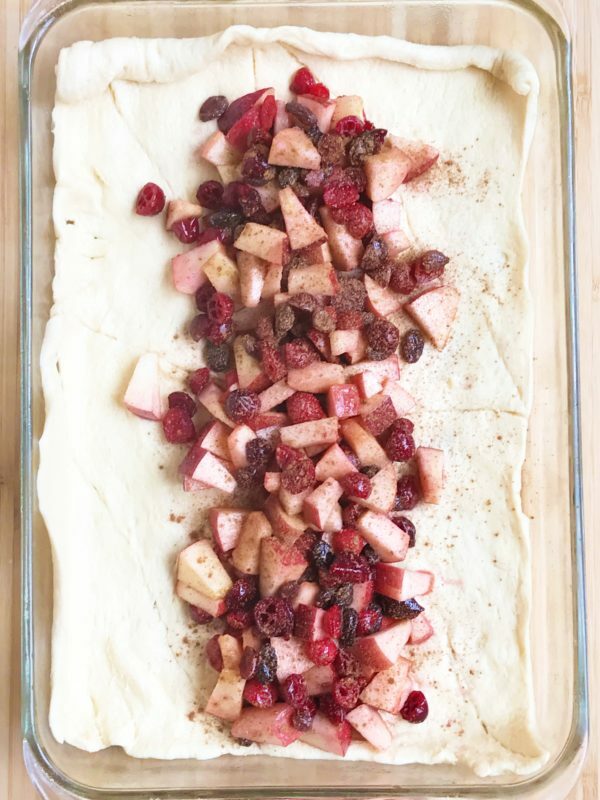 Spoon fruit mixture down the center of the dough approximately 2-inches wide. Sprinkle cinnamon lightly over the fruit. Using a sharp knife or kitchen scissors, cut slits into the dough on each side of the fruit 3/4-inches wide. 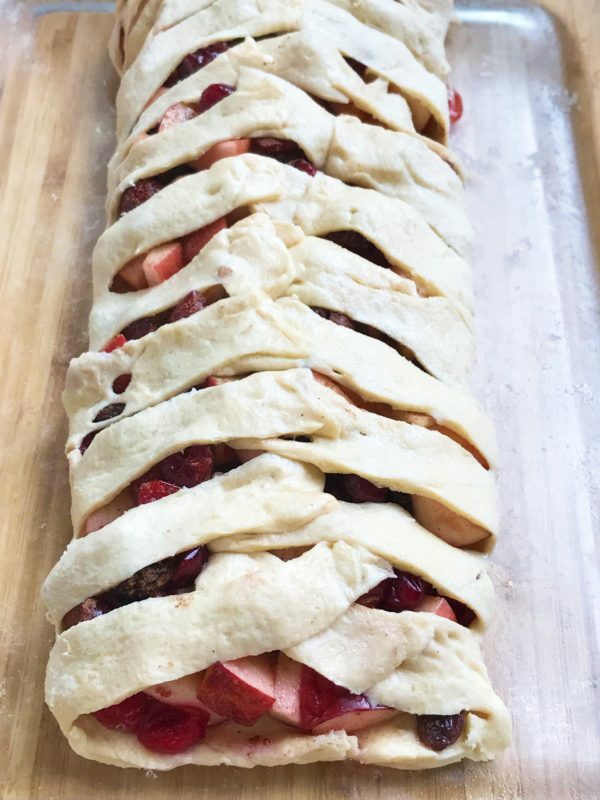 Carefully begin folding strips over the fruit, criss crossing the dough like a braid. When you reach the end, fold the ends over and seal with fingers. Melt butter and brush the top of the crescent braid. Bake for 30 minutes being careful that the top does not burn. Cut and serve warm or cold. Make it your own! 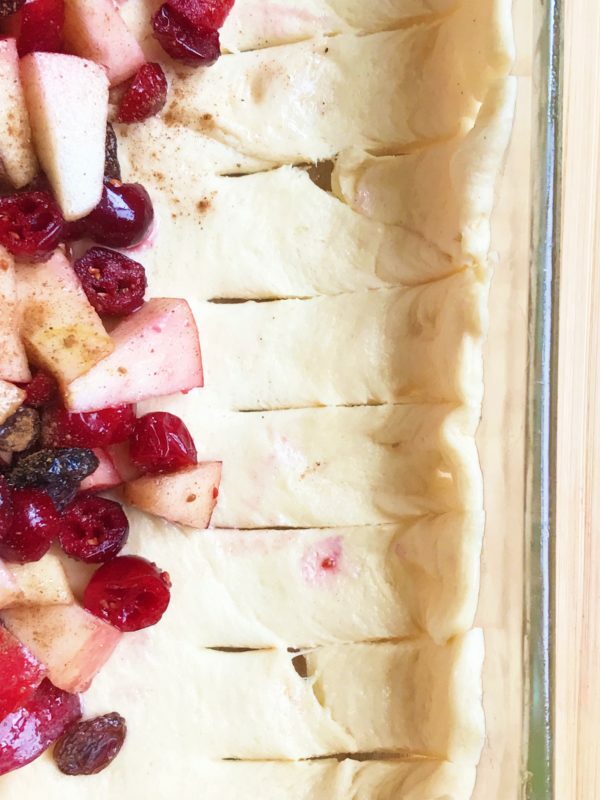 Use your favorite fruit combination for this crescent braid. Serve hot with vanilla ice cream or cold with a cup of tea or tall glass of cold milk.